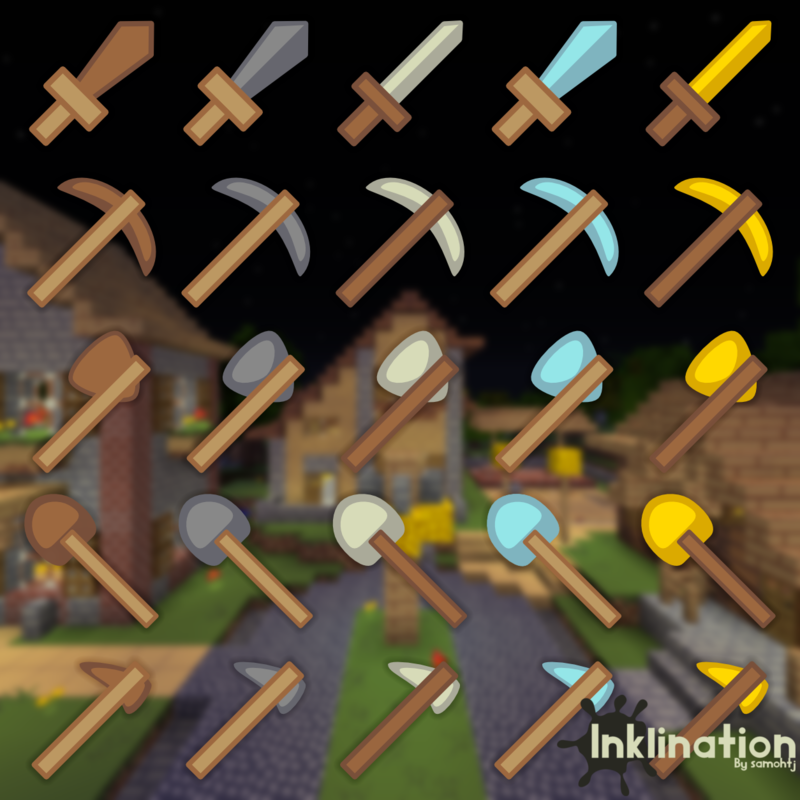 Inklination is a simple, illustrated pack created for the Simple Pack Showdown 2. This pack is completely vector-based, made entirely in Inkscape. I've had a little experience with vectors before, but this is the largest vector project I've undertaken so far. The pack is and always will be a work in progress, though it is certainly playable. I'd encourage you to check it out, in your preferred resolution, and leave a comment with your thoughts on the pack! I love feedback, and am always looking to improve my work. Inklination is completely vector-based, and is available in multiple resolutions. 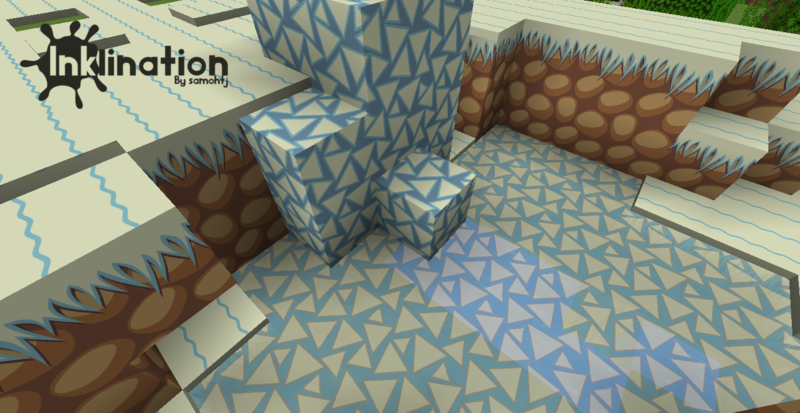 Download the texture pack using one of the three widgets above. Select the pack, and you're done! Gold: A strict level of security. Having this on your pack indicates that your textures can only be used after written permission is obtained from the creator of the pack. It also indicates that adfly links on remixes are never acceptable, under any circumstances. Make videos with this pack in use. You must place the full name of the pack in the video description, as well as a link to this thread (this is so the video shows as a result when people search Google for this texture pack). Monetization of videos is allowed. Use this pack as your server's official texture pack. Please contact me for a direct download link. Do not host the pack yourself. Edit these textures for your own personal use (no distribution). Take and share images of the pack in use in the game. Please place the full name of the pack somewhere on the page, as well as a link to this thread (this is so the image shows as a result when people search Google for this texture pack). Monetization of images you created is allowed. 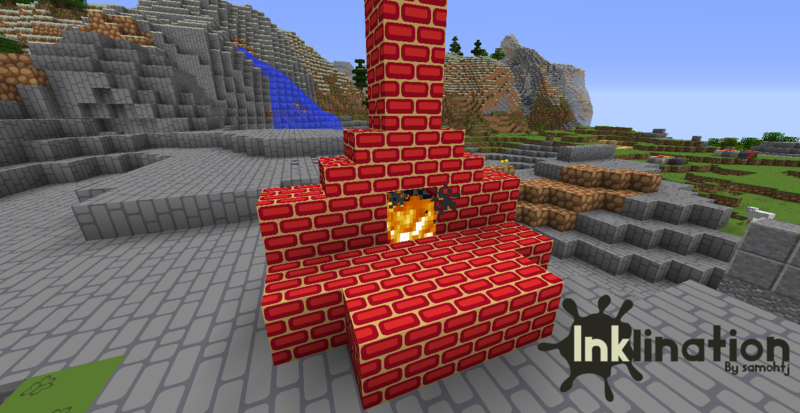 Link directly to the download for this texture pack. Please use one of these URLs, as they are always up-to-date. Redistribute this pack or any individual textures, in original or edited form, without my express written consent. Meaning, I have to personally give you the go-ahead before you can distribute any of my work. Paste this image into your signature to show your support for this pack! The style is fresh and beautifully vibrant, without being overpowering, including a lot of cleverly thought out textures. The whole thing hangs together really well...certainly has my seal of approval! I'm still absolutely shocked that this took third place behind Quadral and Fall of Autumn. This is an absolutely AMAZING pack. I'm extremely happy that you published it! I am super impressed this is amazing. So.... God came to us to bring us a Resource pack. PS: This is freaking fascinating. 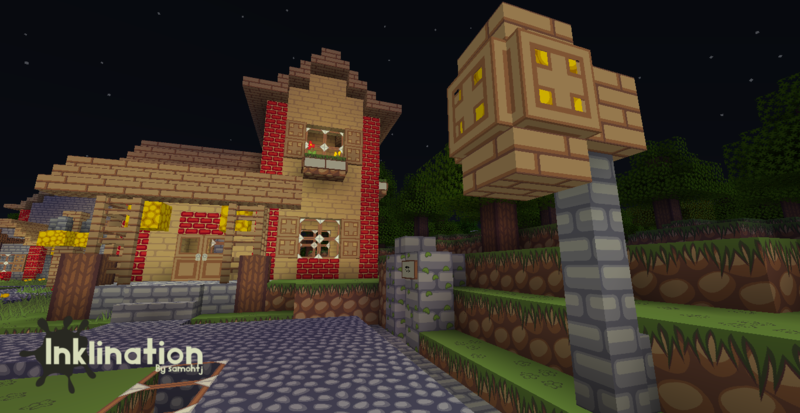 This is really nice and it gives Minecrat a fresh, nice look! I also added the pretty font that's featured in all the branding images you see in the thread. Hope you enjoy! Hey there! I'd like to show off things as I do them, instead of keeping them to myself, so I'll be posting everything I make here as I make it. Hopefully I can get this thread a little more active! If I keep up this pace, I'll be able to put out weekly updates. I'll post more as it comes, and have an update ready by next Tuesday, hopefully. Love the new tools! So simple, and yet the design and shading are just so perfect. Thanks, Steel! Glad to hear you like it. So, I promised weekly updates, and I'm delivering. 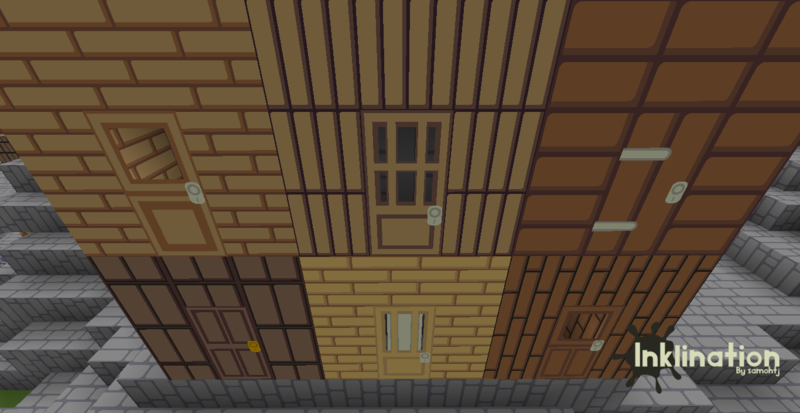 I've added all the doors, the bricks, the icons, and these new things I did today to the download. Why is it 1.6.2? Is it because it doesn't have the 1.7 and 1.8 textures yet (and that you are going to make them) ? Or are you going to leave it in 1.6.2? I am most likely inactive on this account! If you want to contact me, here's my Twitter @PandawanYT. So close to releasing my new map! Gonna beta test it next week... Probably coming out in two weeks! Follow My Twitter for more info! When I upload the file, I can put a checkmark next to every version of Minecraft that that file supports. I guess it only displays the lowest one. Don't worry, I'll make sure that the next file I upload will show 1.8 as the supportd version. 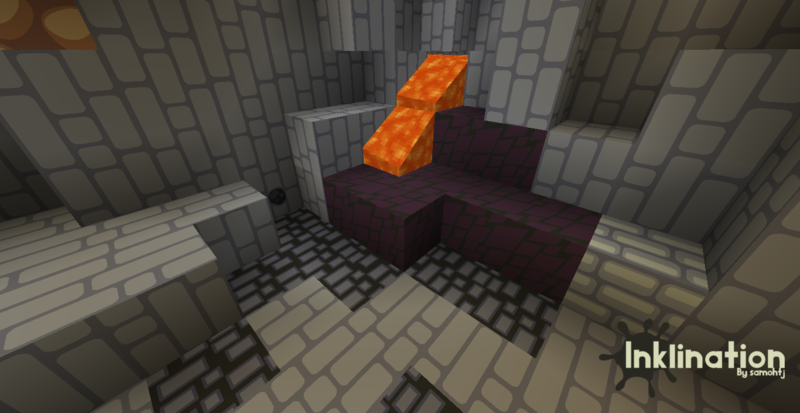 In case you were worried, any resource pack will work for version 1.6.2 and onward. It may not have all the textures, but it will still load just fine. 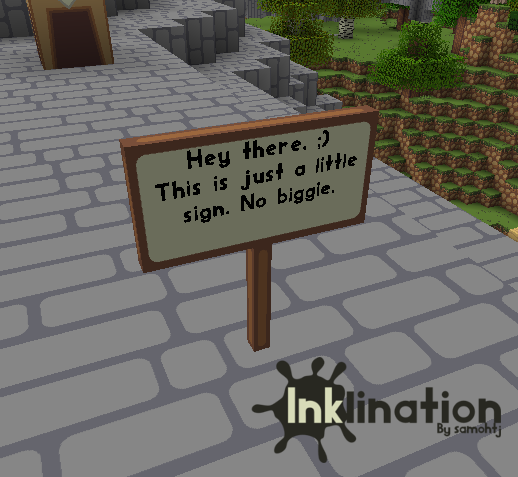 Inklination is still a work in progress, so it doesnt have all the textures yet, but I did check today, and the blocks folder is over 70% completed! Ok, thanks, this ressource pack is awesome by the way! I've got another update ready! I've redone a few things, as well as added some new material. 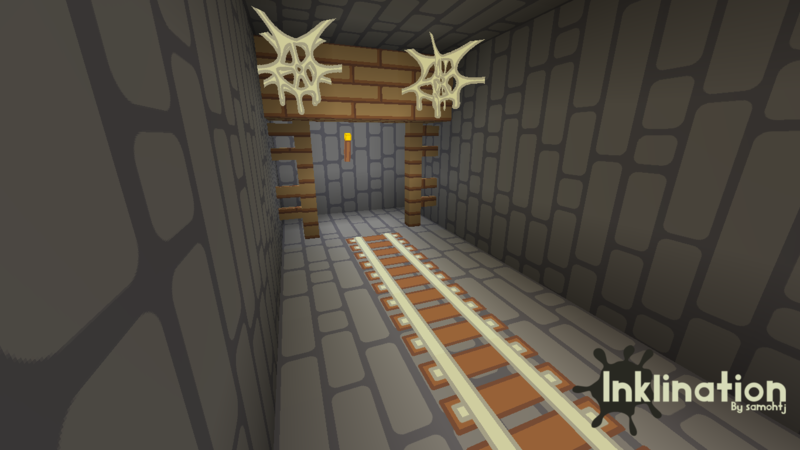 And finally, trapdoors! I took a fancier screenshot of Kab's texture showcase for this one. As always, downloads are available in the OP! I hope you all enjoy! And I did make sure to check the right options when I was uploading. The supported version should show up as 1.8.1 now. I've got to admit, I love it! You're so artistic in many styles, most RP creators only make Realist, or Cartoony, ect. You on the other hand, make them all! It looks fantastic! Hi. I play ModPacks to challenge my mind. Bye. when there will be an new update? I'm working on stuff right now. I'd prefer not to publish an update until I have a reasonable amount of new stuff, but that shouldn't be to far into the future. Expect an update later today or tomorrow, with some GUI elements and some new blocks. Also, my apologies to everyone who's downloaded the 128x version recently. Apparently my last update did not upload, and the 128x download is a version behind. Why does everyone use Sphax when this pack exists? This looks so much better than Sphax does!